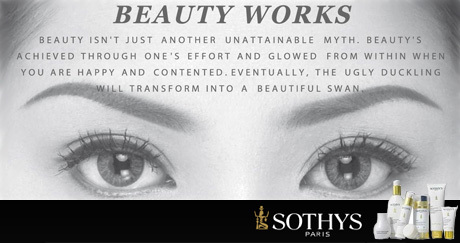 More than 20 Sothys signature treatments are available at Beauty Works, including the exclusive Institute Treatments which sets Sothys apart from other leaders in the industry. We are trained by estheticians from the Sothys Institut de Beaute in Paris and are the ultimate experts in the Sothys technique, giving Beauty Works the utmost authenticity. This week Everyday.com.my introduced super deal from Beauty Works. Beauty Works opened its door in the beginning of 2010, under the direction of June Hew. Our goal is to create a safe and nurturing environment where each person can feel comfortable in their own skin. From our signature facials and digi-esthetique massage methods to our express services, Beauty Works strives to address every skin and body care need. It's RM 50 for 2 Times Trial Face, Eyes, Lips & Neck treatment worth (RM 1036) !! Each treatment package is worth RM 518. An efficient treatment against wrinkles,dark circle and eye bags. I don't think we can get this kinda of deal anywhere else! RM25 for each facial for facial worth RM518!!! To buy or find out more about this promo, click here! You wouldn't want to miss this offer!